Guppy Mysteries? What are they? That does sound fishy, doesn’t it? So, I’ll admit—the Gup­pies are a chap­ter of Sis­ters in Crime. I’ve been a Gup­py for years and years, but I met all my chap­ter-mates on line only. Until… I went to Mal­ice Domes­tic a few years ago. Then I met sev­er­al Gup­pies. (Yea!) And they are pro­lif­ic mys­tery writ­ers. Three of them have new books just out (or com­ing in a few days). Here are their new cov­ers. All three pub­lish more than one series. Daryl Wood Ger­ber writes under two names. Her oth­er author name is Avery Aames. (You will find each author’s Ama­zon author page linked to their names.) A Souf­flé of Sus­pi­cion will come out July 10, 2018. This is the sec­ond of her French Bistro mys­ter­ies. The blurb starts this way: The buoy­ant mood at Bistro Rousseau deflates when Chef Camille’s sis­ter, Renee, turns up dead in the chef’s kitchen, and Mimi Rousseau must tease the real killer out of a mélange of men­ac­ing char­ac­ters. Oh, that does sound like an entic­ing read! Mur­der at the Man­sion is the first mys­tery of Sheila Connolly’s fifth series! (Which is why I’m only send­ing you to author sites. Soooo much to choose from with these Gup­pies.) A bit from the blurb… Kather­ine Hamilton’s goal in high school was to escape from her dead-end home­town of Ashe­boro, Mary­land. Fif­teen years lat­er... she is invit­ed to return… There’s the high school neme­ses… Who turns up dead, in the man­sion. This was pub­lished June 26, 2018. It sounds like a deli­cious read. 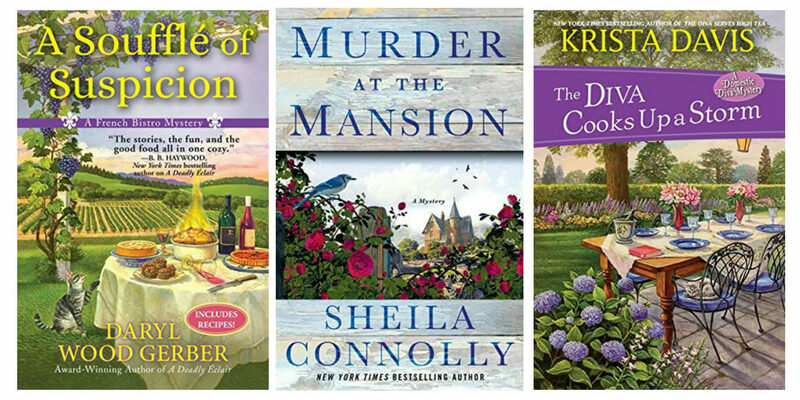 Sheila also has the Coun­ty Cork series that takes place in Ire­land. The Diva Cooks Up a Storm is Krista Davis’s most recent­ly pub­lished mys­tery, pub­lished May 29, 2018. It is the lat­est in her Domes­tic Diva series. The blurb starts: When a trendy, under­ground din­ner club leaves some guests six-feet-under the table, enter­tain­ing pro­fes­sion­al and ama­teur sleuth Sophie Win­ston hopes she has all the right ingre­di­ents to put a mur­der­er on ice in New York Times best­selling author Krista Davis’s new Domes­tic Diva mys­tery … Krista also had anoth­er mys­tery pub­lished on Feb­ru­ary 27, 2018. It’s Col­or Me Mur­der, the first of her third series, and the front and back cov­ers can be col­ored! I knew these authors (elec­tron­i­cal­ly) before they were pub­lished! It was won­der­ful to meet them and oth­er Gup­pies in per­son. Vis­it their Ama­zon author pages to see an amaz­ing choice of sleuths and mys­ter­ies.